A year ago, Punjab, Haryana and Rajasthan engineers manning this dam held a ‘havan’ and a ‘path’ to pray for rain. This year they might start praying again, only for the rain to stop with heavy inflows continuing to raise the dam level, which is expected to go up to 1,672 feet by nightfall despite a four-feet opening of the floodgates this morning. 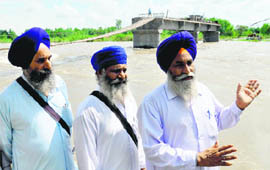 The Punjab Government is keeping a vigil on the bundh created on the Sutlej which used to flood up to 10 villages every year, but it seems it is kar sewa baba - Sant Labh Singh of Kila Anandgarh Sahib, who is providing succour to villages in this area by constructing bridges across the Sutlej to their hearths and homes. The district administration today sounded a high alert in villages located in the close vicinity of the Sutlej, as the water level has started rising in the river. Five workers of a paper mill were killed after an explosion in a drier machine late last night. Four of them died on the spot while the fifth succumbed to burn injuries on way to Rajindra Hospital, Patiala. The deceased have been identified as Guddu, Mukesh, Gudu Tiwari, Dev Prakash and Jeevan. 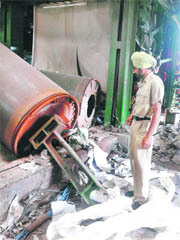 According to the management of the mill, Durga Duplex Mill Private Limited situated on the Dhuri road in Malerkotla, the machine in which the blast took place was installed recently. Four members of a family, including two women and a child, were murdered by unidentified assailants in cold blood at Satnam Nagar in Doraha. Have you seen any green land in Punjab, which is otherwise devoid of trees and has the dubious distinction of having minimal forest cover? If not, drive through this part of the state and you will find one. In fact, it is a treat to drive through this part of the region at this point of the year. In a bid to sort out differences between the ruling coalition partners, the SAD and the BJP, particularly in the Malwa belt, Chief Minister Parkash Singh Badal today took the initiative to restore harmonious relations between the two parties by having lunch at the residence of a municipal councillor of the BJP, Mithu Ram Gupta, here. A group of Sikh MPs, accompanied by a couple of Muslim MPs, may head for Kashmir in the coming days to re-assure the Sikh community of the valley of security of life and property of its members. Inmates lodged in various jails of the state will be able to get rakhis tied by their sisters this festival as the state government has issued a special order allowing them entry to jails between 9 am to 5 pm. This was stated today by Jails Minister Hira Singh Gabria who said the government had issued a special order allowing women to meet their prisoner brothers in jails and all arrangements had been made for this purpose. If a public information officer (PIO) responsible for supplying information under the RTI Act thinks that his retirement would be the end of his RTI woes, here is a shocker. Following the directions of the Union Home Ministry, the Punjab government has created a special cell, headed by IG BK Bhawra, to crack down on illegal migration and tighten the noose around unscrupulous travel agents across the state. Solar energy is all set to be tapped for the supply of power to the Golden Temple Complex. The future of hundreds of students who sought admission under the recently introduced semester system of the Punjab School Education Board (PSEB) hangs in the balance as those taking admission between May and June will have only two months to prepare for the ongoing semester. The difference in what a labourer is paid per day according to the market rate and what he gets under the National Rural Employment Guarantee Scheme (NREGS) is deterring the labourers from joining the scheme. The market rate hovers between Rs 200 and Rs 250 per day whereas the rate per day under NREGS for labourers is Rs 123. Seven more cases of diarrhoea were reported today at Bhamarsi village and three of them admitted to the Civil Hospital. As many as 37 newborn offsprings of rare species of sand boa would soon be released into a forest area. Sand boa, a rare variety of two-mouthed snakes, which do not lay eggs and are said to be a missing link between mammals and reptiles, yesterday gave birth to 37 snakes in Mahendra Choudhary Zoological Park. The tug-of-war between the Punjab Cricket Association (PCA), Mohali and the state Sports Department is heading towards a resolution with the former submitting a formal proposal offering to pay back the government grants with interest or even handover the stadium to the government in return for money spent on developing the facility. There’s an urgent need to slam brakes on school buses that are breaking traffic rules with impunity. Heavy inflows of 90,000 cusecs last night and 75,000 cusecs today along with reports of heavy rains in the catchment area has forced the Bhakra Beas Management Board (BBMB) to have a rethink on whether the water level in the dam should be allowed to increase by one feet every day. Under the present strategy, the dam level was to be allowed to go up by one foot each day till the maximum level of 1,680 feet. BBMB Member Irrigation MK Gupta is very clear that the safety of the dam is paramount. “I will not allow the water level in the dam to increase by more than half a feet each day after August 26 if the present trends continue,” he said, adding that a special meeting with the partner states had been called on August 26 to discuss the issue. The water level is expected to go up to 1,676 feet by August 26. What this means effectively is that the dam authorities could well release double the amount of water released today. The discharge of 16,000 cusecs this morning has already put the Sutlej in spate and it has entered a few villages near Anandpur Sahib. A discharge of 30,000 to 40,000 cusecs could flood more than 20 villages in the Nangal- Ropar belt where there are no embankments along the river. Talking to this reporter, dam Chief Engineer Baldev Singh said senior officers had been put on duty round the clock to watch the behaviour of the dam as well as the spillway gates. As the Tribune team travelled 500 feet from the base of the dam to its top, one could see activity in the various galleries with senior officers making checks. Motorboats have also been pressed into service to check for any weak points in the reservoir as the dam is steadily filling to its brim. The dam Chief Engineer says if the present trends continue, water will continue to be released from the floodgates for the next 10 days or so. He, however, said what was worrying him was an emergency like a sudden flash flood, which could unsettle all plans. “The maximum inflow (40,000 to 50,000 cusecs) is coming in from China,” he said, adding that there were reports of flooding still in China. Meanwhile, the Indian Meteorological Bureau has predicated heavy rains in isolated places. The reports from BBMB stations in the catchment areas are mixed with half of them reporting clear skies and the other half cloud formations. Earlier today, the dam authorities opened the floodgates at 8 am by two feet first and then by another two feet at 9.30 am to release 16,000 cusecs of water into the Sutlej. While the bundh on the Sutlej here is safe as of now and is even still being strengthened after Rs 2 crore being spent on it, a concrete bridge is coming up on the Sutlej bed to link this village with the rest of the world. Burj, Chandpur Bela, Gobindpur Bela, Hariwal, Ballawal, Mehndikalan and a few other villages are situated in between the dominant left creek of the Sutlej and the minor right creek of the river. Villagers, who live on a virtual island, feel the pinch most during the monsoon when the river hems them in. 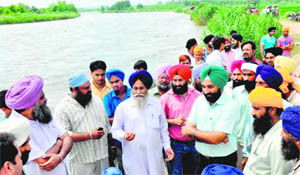 Burj sarpanch Surinder Singh says the Drainage Department has constructed a bundh on one side of the river and saved nearly 10 villages from flooding, but the water is at present getting deflected and wreaking havoc in their villages. Tara Singh, another villager, says water had entered their school building and that if the present trend continued, it could damage their village also. The only succour for the villages is the bridge being constructed to link their village with Anandpur Sahib and Nurpur Bedi on both sides of the river. This is only one of the bridges being constructed by kar sewa baba - Labh Singh. He had earlier constructed a bridge for the people of Chandpur Bela who used to come in droves to participate in his community programmes. “We appealed to him and he has started work on a Rs 20-crore bridge project for us”, says Tara Singh. Anandpur Sahib Subdivisional Magistrate Arvind Pal Singh Sandhu, who was at the bundh site today, however, claimed the government was alive to the problems of the villages and that a Rs 55-crore bridge had been constructed at Serai Pattan to connect Kiratpur Sahib and Nurpur Bedi. Meanwhile, Drainage Executive Engineer Kamaljit Singh said the bundh opposite to Burj village was being strengthened with the Sutlej making new erosions. He said the river was in spate already and might not be able to take in more water in case the Bhakra Dam authorities decided to increase the discharges from the floodgates. He, however, said the seasonal rivulets, particularly the Swan that joined the Sutlej near here, were dry at present. Strong currents of the river also claimed the life of Bashir Ahmed, a jawan of 143 Battalion Border Security Force when his boat capsized late last evening. The incident took place when he was on patrol duty in the Basti Ram Wala area. The body of Bashir Ahmed was sent to his native state Jammu and Kashmir today. The alert was sounded after a team led by state Irrigation Minister Janmeja Singh Sekhon visited many areas from Hussainiwala headworks to Harike headworks to monitor the situation. Chief Parliamentary Secretary Sukhpal Singh Nannu, the DC, KK Yadav, the SSP, SPS Parmar, SSP, and Chief Engineer (Drainage) Vinod Chaudhary also accompanied Sekhon. Rajesh Gupta, DIG (BSF), Ferozepur sector, said precautionary measures had been taken to save its border observation posts. Five workers of a paper mill were killed after an explosion in a drier machine late last night. Four of them died on the spot while the fifth succumbed to burn injuries on way to Rajindra Hospital, Patiala. The deceased have been identified as Guddu, Mukesh, Gudu Tiwari, Dev Prakash and Jeevan. According to the management of the mill, Durga Duplex Mill Private Limited situated on the Dhuri road in Malerkotla, the machine in which the blast took place was installed recently. Sources in the police maintained that the blast took place due to high pressure in the steam-operated drier of the air machine. The owner of the paper mill, Ajay Goel, said there was no fault on the part of the management and the blast was just an accident. The deceased had recently joined the mill and used to operate driers of the air machine, which works on steam. The police is yet to get details regarding the latest inspection of the machine and also whether it was being operated at high pressure when the blast took place. Malerkotla DSP Sukhdev Singh Virk said a case under Section 304-A of the IPC had been registered against the owner and three other persons for negligence at the City Police Station. He added that the paper mill had been sealed and the part of the drier and a gauge used to measure air pressure had been taken into possession. “We have sought technical opinion on the cause of the explosion from the Industries Department," the DSP added. He, however, ruled out any terror link. The incident came to light this afternoon when a relative visited the house of the victims and found all the four dead. The victims have been identified as Charanjit Kaur (40), Jassa (18), Karamjit Kaur (12) and Navdeep Singh (4). While Karamjit and Navdeep were children of Charanjit Kaur, Jassa was their distant cousin and was staying in their house following the death of Charanjit's husband. According to the police, area residents complained of the foul smell emanating from the house. After receiving no response from inside, the relative broke open the main door. And found all the four dead. The police said the murder might have been committed two days back as the bodies were stinking. While Jassa was bludgeoned to death, the bodies of other three -Navdeep, Karamjit and Charnajit - bore injury marks. However, the police failed to find any weapon form the scene of crime. Meanwhile, the police is working on various theories. The police is suspecting personal enmity behind the incident. According to colony residents, victim Charanjit Kaur had recently purchased a house in Satnam Nagar following which her husband committed suicide under mysterious circumstances. The residents even raised fingers on the character of Charanjit Kaur and said that she had been recently acquitted in a criminal case. The area where the crime took place is heavily populated and how the assailants fled the scene without being noticed is still a mystery for the police. Meanwhile, the Payal police has registered case against unidentified assailants and started investigations. The entire local region appears to be dressed in green. Shade of serene green meets the eye as far as it can see. Stately poplar trees, with Shivalik hills in the backdrop, have imparted a splendid look to the area. 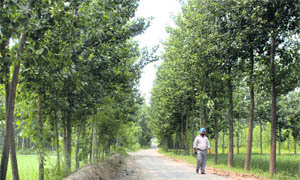 Sprawling plantations of poplar trees have come up in the countryside, especially along the Ropar-Nawanshahr stretch of the highway. Besides, lush green paddy fields have added to the beauty of the poplar tree lines. All this has happened because farmers have taken to commercial farming of poplar. And it is a recent phenomenon. Earlier, most of the local region was devoid of trees. Being close to the Shivalik hills, the area is prone to flash floods. There is virtually a web of choes and other season rivulets in the area. However, most of these choes, which earlier used to play havoc in the region during the monsoon season, have been tamed over the years. The land is suitable for the commercial farming of the poplar, which matures in six years in other areas but takes only five years in this region to be mature for harvesting. And growing of poplar is a profitable venture at least in the region where growing of other crops is not as money making. “After every five year, one can earn about Rs 3-4 lakh, depending on the poplar timber in the market. That means average income of Rs 60 to 80,000 every year. It’s a good income from a farmers’ point of view, keeping in view the texture of the soil in the region,”said Ram Nath, a farmer engaged in poplar growing. After harvesting, another crop of poplar is transplanted. Good quality poplar plants are available in various nurseries, which have come up like mushrooms in the area. And input cost on growing poplar is far less compared to other crops in this region also known as the Kandi area. State BJP general secretary Kamal Sharma, other councillors of the party and the area in charge of the SAD, Sarup Chand Singla, were also present. Badal also made an effort for rapprochement between two senior estranged SAD leaders, Chiranji Lal Garg and Sarup Chand Singla, by making them sit together at the residence of the former. Differences have been growing between the SAD and the BJP leadership here during the past some time. BJP leaders even abstained from the visit of Badal when he recently went to the residence of victims of a blast here that claimed five lives. The BJP leaders visited there separately the next day. SAD and BJP councillors have been acting as staunch rivals making serious allegations against each other at meetings of the Bathinda Municipal Corporation (BMC) while the opposition Congress sits pretty in the house. Before returning to Chandigarh in the evening, Badal drove to the residence of Chiranji Lal Garg, a former minister, for tea where Garg’s archrival Singla was also invited. Badal asked the two to sink their political differences as their rivalry was affecting the party’s image. Recent reports of threats given to members of the Sikh community in the Kashmir valley rocked both Houses of Parliament. Union Sports Minister Manohar Singh Gill says that he had organised a couple of meetings of the Sikh delegations with the Prime Minister also. Meanwhile, Gill says he has taken up the matter with Union Home Minister P Chidambaram, urging him to take all steps to assure Sikhs living in the valley of their security. On a suggestion from former Rajya Sabha member Tarlochan Singh, a group of Sikh MPs, including Mohinder Singh Kaypee, Partap Singh Bajwa (Congress), Sukhdev Singh Dhindsa (Akali Dal) and SS Ahluwalia (BJP), have agreed to visit the valley and meet not only the senior functionaries of the J&K Government but also leaders of the Muslim community and also some of the militant organisations. “There have been instances when members of minority communities were targeted in Chhattisgarh and Maqboolpura. And on both occasions, a visit by a delegation of MPs achieved encouraging results and no more attacks against the minorities were reported afterwards,” recalls Tarlochan Singh. The delegation of Sikh MPs will also call on J&K Governor NN Vohra, Chief Minister Omar Abdullah and also senior police and security officials. The delegation will also meet leaders of the separatists to urge them not to target the minorities in general and the Sikhs in particular. He said directions had been given to all superintendents of jails in the state. ‘‘The government will show its human face on the festival of love between brothers and sisters. The Rakhi festival also has a social significance as it conveys a message that everybody should live in harmony,’’ said Gabria in a statement issued here this evening. The Punjab Information Commission on August 19 asked the Secretary, Education, to extract a penalty of Rs 25,000 imposed on a PIO from her pension as she had been found responsible for having not given information when she was in service. Taking up a complaint filed by a resident of Sangrur Kamaljit Sharma against PIOs in the office of the district education officer, Sangrur, and the chairman, Rationalisation Circle Education Officer, Patiala, the Nabha State Information Commissioner, Ravi Singh, ordered that the penalty amount would be recoverable from the pension of a PIO. She noted that the commission had in July 2010 directed the Secretary, Education, to recover the penalty amount of Rs 25,000 from Balwant Kaur, since she was the PIO from August 6, 2008, to May 20, 2009 and during that period information was denied to the complainant. Kuldip Singh, DEO, Sangrur, told the commission that he had no idea as to how the penalty was to be recovered since Balwant Kaur had retired on May 31, 2009. “This order is being sent to the Secretary, Education, to recover the amount of penalty i.e. Rs 25,000 from Balwant Kaur’s pension and intimate the commission within a week,” Ravi Singh added. According to sources, the problem has aggravated in Majha and Malwa regions in the last over 10 years after originating in the Doaba region almost two decades ago. The police department has appointed a nodal officer of the rank of SP or DSP at every district to enforce the law on illegal immigration. The department has also started preparing a database of the travel agents and immigration consultants, so that their ‘dubious activities’ could be monitored regularly. The travel agents have been asked to keep an additional photocopy (countersigned by the applicant) of each and every document (passport, VISA and air ticket) of the applicant to make the deal transparent. The agents must have the mandatory permit issued by the Protector of Immigrants for running such a business. In a pilot project, the Punjab Energy Development Authority (PEDA) is in the process of installing a water heater of 4,000 l capacity and a 18 KV solar power station for the utilisation of hot water in Guru Ram Das langar building and for the generation of power for the Golden Temple Complex. “The water heater and solar power generation projects are likely to get completed in the first week of October. The capacity of the projects will subsequently be increased in a phased manner as per the requirement,” said PEDA Chairman Bhai Manjit Singh and SGPC secretary Dalmegh Singh Khatra. While the solar water heater work had been accorded to Chandigarh-based Solar Synergy, the solar power generation project would be set up by Delhi-based Punj Allied Company. While, the semester exams will be held on September 6, the board allowed schools to admit students in the current session till as late as July 14. However, both students and teachers are finding it hard to go through the syllabus even once. According to the new system, the board has decided to divide the syllabi of both classes in the ratio of 40:60 and to conduct examination twice a year on the basis of the division in the months of September and March, respectively. “Many students have been admitted in July after the summer vacations. How will such students be able to complete their syllabus in just two months,” asked Rajinder Sharma, president, PSEB Affiliated Schools Association. However, DS Dhillon, chairman, PSEB, said, the board was not responsible for those students who did not get admission in time. He said there were only a few hundred students who took admission in July. Rather, it was the responsibility of an individual to get himself admitted in time, he added. Of the three villages -- Khairi, Kammo Majra and Elwaal -- where The Tribune studied the impact of NREGS in changing the fate of the villagers, in Kammo Majra and Elwaal there are a negligible number of labourers availing the benefits of the scheme. The sarpanches and labourers in these villages say that though the scheme assures a guaranteed job for 100 days for a family, going by the daily rate for NREGS, fewer villagers are deriving benefit from the scheme. Investigations by The Tribune show that in one of these villages, a majority of beneficiaries are women who cannot go outside the village to work as labourers. In Elwaal village, the sarpanch says the scheme has failed to evoke any response. In another village, Kammo Majra, the sarpanch, Sarabjeet Kaur, says that owing to the difference in the NREGS and the market rate, labourers prefer to work outside the village. She adds that since the Junior Engineer of the Rural Development Department measures the amount of work done by labourers under NREGS, it further distances the labourers from the scheme. The village has eight-10 villagers having job cards under NREGS. In Khairi village, sarpanch Ranjeet Singh avers that even as the number of job card holders is about 250, a majority of these are women who prefer to work inside the village. A labourer in Elwaal village confirms that the difference in wages has resulted in many labourers not availing the benefits of the scheme. Deputy Commissioner Harkesh Singh Sidhu told The Tribune that the rate was fixed by the Central Government; the local administration had nothing to do with it. He confirmed that the villages where NREGS had evoked a good response, a majority of the labourers were women. Villagers maintain water contamination is the reason behind the spread of the disease in the area. Two of the affected villagers died after brief illness on Tuesday night. Health Department officials said the situation was now under control and all the affected villagers were out of danger. Chief Medical Officer (CMO) Dr Reena Sandhu said only three patients were admitted to the hospital today. “Doctors are examining villagers and free medical facilities are being provided to them round the clock,” she said. Principal Secretary (Health) Satish Chandra paid a visit to the village and enquired about the treatment being provided to villagers. The doctors said with seven fresh cases, the total number of patients had gone up to 113. They were having mild fever and headache, but none of them suffered from vomiting. District Health Officer (DHO) Dr Ramneek Kaur said 425 patients had been examined at the health camps organised at the village and the Civil Hospital over the past four days. Former Forest Minister of Punjab Dr Harbans Lal and some other local politicians also reached the village to enquire into the health of villagers. Though fresh water supply was resumed today after cleaning the water pipes, villagers were still apprehensive and they did not consume water being supplied through the taps. They were still using water provided by the district administration through temporary water tanks. Zoo authorities said suitable habitat would be searched for them. “We are searching for forest area with sandy soil for the snakes. However, it will take at least a month or so for the release as the snakes are too young to be released in open area,” said the zoo officials. Two female sand boa snakes were brought in the zoo on the orders of a Ludhiana court. The snakes were seized from some unscrupulous elements and zoo authorities were told to keep them in the zoo on court orders. Zoo field director Churchil Kumar while talking to TNS said the snakes are court property and they could not put them on display. We have also informed the court about offsprings of the sand boa in writing today. Though we are not provided with any funds for care of these snakes, however, two separate cages have been prepared to accommodate the newcomers. The authorities said the expenses incurred on the care of these snakes were meager. Security of the snakes is our chief concern, they added. PCA president IS Bindra has submitted a proposal in this regard to Chief Minister Parkash Singh Badal. The PCA chief has also held a meeting with Deputy CM Sukhbir Singh Badal, who is the Sports Minister on the issue. The Deputy CM yesterday said the matter was still to come to him as chief secretary CS Aggrawal had been asked to study it. Sources said the CS could also negotiate with PCA and address the concerns of the Sports Department, while trying to resolve the issue amicably. According to the PCA sources, the association has put two specific proposals to the state government. One states that the association was ready to pay the Rs 10-crore grant given to it for building of the stadium in the late 90’s with interest. If interest was calculated at the rate of eight per cent, this amount came to Rs 23 crore. The PCA was also ready to pay for the price of the land. The PCA had for the first time also made it clear that it was ready to give up the stadium if the government was ready to pay for it. A proposal stated that the assets should be valuated with the land cost being constant. Under this proposal the cost of the assets created at the site came to around Rs 60 crore. The PCA said it could use this money to build another stadium at Mullanpur on the outskirts of the city for which it has already purchased land at a cost of around Rs 45 crore. A few high-level meetings have already been held on the issue and an independent proposal to index the investment of Rs 10 crore according to present times has also been moved. Once indexed, the Rs 10-crore grant could swell to Rs 35 crore. The Sports Department on its part still had reservations on the amounts being discussed and would try to move for a higher settlement. Come what may the settlement proposal was a win-win situation for both the PCA and the government. While PCA would have its stadium without any encumbrances, the state government would see its Rs 10-crore grant being converted into a loan. The PCA had also promised to work for making Punjab a nursery for cricket and this was in line with the Deputy CM’s initiative to create a sports hub in the state. The PCA would take up the creation of the cricket infrastructure in 500 schools in the state that would include creation and maintenance of pitches and supply of cricket gear. The organisation would spend at least Rs one lakh per school. Meanwhile, besides establishing a new stadium at Mullanpur, the PCA had given a bid for a stadium at Bathinda and had been helping the Local Bodies Department to establish an international stadium at Burlton Park. If this comes about, Punjab would become the only state along with Maharashtra to have four international stadiums. An affidavit submitted by the Punjab government to the Punjab and Haryana High Court reveals that more than 100 school buses were on an average are challaned in the state every month for violating traffic norms. The affidavit, submitted by state transport commissioner R Venkat Raman was placed before the Division Bench of Chief Justice Mukul Mudgal and Justice Ajay Tewari. The Bench is currently listening, among other things, to petitions filed in public interest. In the document, based on suggestions made by HC advocate Manisha Gandhi, the transport commissioner has quoted available record to assert that the department issued 314 challans to school buses from April 1, 2010, to June 30, 2010. The assertion came on a public interest litigation sent by post to the HC by Jasbir Singh of Jhabewal village in Ludhiana. Referring to newspaper reports, the petitioner claimed that incidents of students being grievously hurt, or even killed, due to overloading of school buses were on a rise. Taking up the petition, the Bench directed that the affidavit be placed on record. “Let reply on the behalf of state of Haryana and Union Territory of Chandigarh be filed within three weeks”, the Bench asserted. Before parting with the order, the Bench fixed November 2 as the next date of hearing.